The other day I was driving somewhere -- actually, I think, driving back from somewhere -- and was listening to Thom Hartmann on the local community radio station here. I mostly like Thom Hartmann, because he seems thoughtful. At least, more thoughtful than the right-wing commenters, by far. 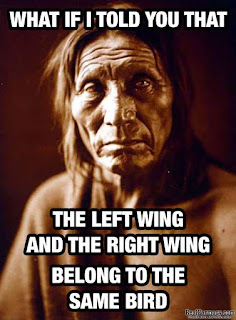 But he also seems very biased towards the left, sometimes reflexively so. 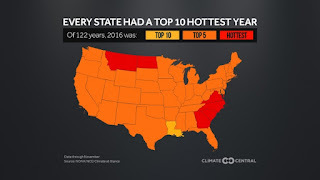 Some caller to his show was asking about solar energy, and Hartmann's response was that solar was cheaper than all other sources and he didn't know why the media wasn't reporting this, but it was probably because Big Oil/Gas/Coal had bought the media with ads and other payoffs. And that was disappointing, because I had just happened to read a very good article about this, and it made a solid impression on me, so I knew immediately that Hartmann was wrong. What's worse is that he immediately dived to a token extreme left position -- media bought off by corporate America -- when he had no evidence of that and, worse, no understanding of the real situation at all (which is always more complex that can fit into their small thoughtless catch phrases). Simply because I read this one article, and understood it, Hartmann looked very small and very stereotypical, and not in a good way. Those kind of instances come along from time to time -- for you too I'm sure -- and they color what you hear/read afterward. It's kinda of a quantum change. Hartmann was just flat out wrong. As was his excuse. As this Bloomberg Technology article covers in good detail, solar is now cheaper where electricity demand is growing and where the capitalization costs of its plants (or farms) competes directly with capitalization costs of coal/gas plants. That's the case in many nations, in Africa, in Asia, and the like -- but not the case in the US. Here coal plants, and many gas plants, have already been built and are either paid off or are being paid off. They have a big jump on capitalization costs, and, I don't know for sure, but suspect, on writing off those capitalition costs. Solar farms are new right out off start. The Ivanpah solar farm in Nevada cost $2.2 B to construct before any electricity was ever delivered. That's a lot of headway. My purpose here isn't to compare prices per kWh to the nearest tenth of a penny and do a full life-cycle cost projection. It's just to point out how eager Thom Hartmann was to blame Big Corp when he really had no understanding of the issue at all. I sent an email to Hartmann about this, but of course never heard back. And isn't that the world we live in these days? 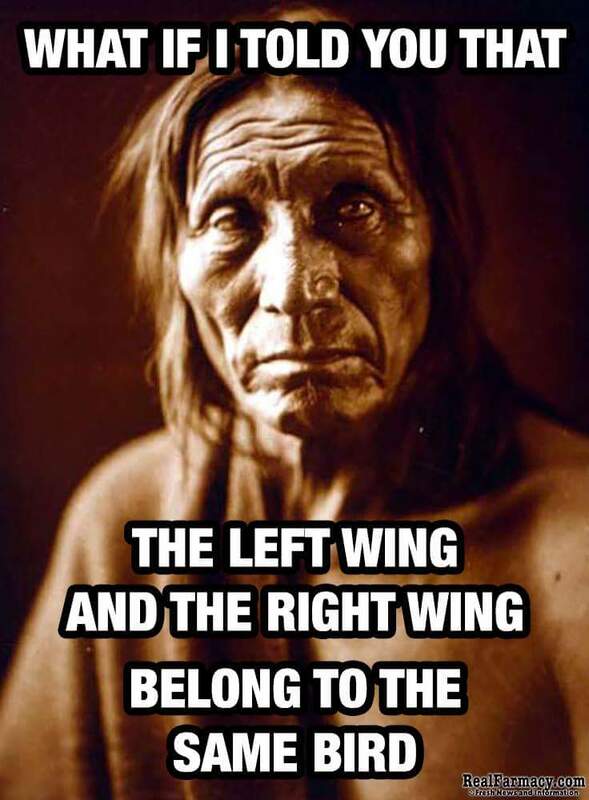 The bigger their audience, the bigger their lies -- oops, their misspeakings -- and all the less interest they have in trying to be right, admist all the complexity. Hartmann, Limbaugh, Hannity, all of them -- they don't care about the truth. They just want to spout, and get to the next commercial. Hell, if they ever wavered, or said they just didn't know, we're probably all punch the button for the next channel we have stored in our console. The next many years are looking to be a lousy time for anyone who cares about the truth and thinks it isn't all that simple at all. Perhaps. You really can't ever ask enough questions. Don't trust anyone, as far as possible. 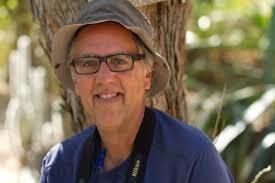 John Fleck, author of Water is for Fighting Over*, will be on KQED on Friday talking about Colorado River water. I hope it's archived, because lately I'm up very late at night and so down in the morning. I'll try to let you know. PS: I reviewed his book here. We've all heard that the warming for a CO2 doubling, absent feedbacks, is 1.2 K. What calculation does this number come from? Does it come from a logarithmic dependence on CO2/CO2_initial? I'm asking, because if it does, then clearly, since the change in temperature with CO2 just 1.45*CO2_initial is 0.8-1.0 K, feedbacks have already started to kick in. John Fasullo et al wrote a paper published in August saying that an accelerating sea level rise is imminent. That's what my calculations show, fitting AVISO and CU sea level to a quadratic. where the error bars are 2-sigma, without autocorrelation. Jo Nova has deleted this odious comment. As well she should have. Thanks. And this trash from "Phil Jourdan"
I'll take this as a victory. Still working on suyts, who thinks I "cyber stalked" him when his real name was, in fact, available months beforehand on this document. And he had already written he lived in Topeka, Kansas. Suyts likes to insult everyone, while using a fake name himself. I resolved to show him how that felt. Clearly I made that clear to him, and it stung. The December issue of Scientific American has an very interesting article on the climate impacts of permafrost melt, by Ted Schur of Northern Arizona University. John Fleck's "Water is for Fighting Over"
I've just finished reading John Fleck's new book. The first thing to realize is that the title is intentionally misleading, even a little risky. 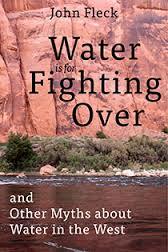 It's full title is, "Water is for Fighting Over: And Other Myths About Water in the West." The subtitle makes all the difference. Because Fleck took a different, refreshing turn on the subject. Disclosure: I know John and have had dinner with him a time (or two?) when I was back in Albuquerque on family business. (My mother, now deceased, lived there, and my dad still does. I went to the University of New Mexico after we moved there in the late 1970s,after the steel industry fell apart in southwestern Pennsylvania. I was an undergraduate there for three years, and graduated with a BA in math and physics.) John is a really great guy, and maybe that influences my review here a little bit. Frankly, it should. It's easy to look at the Colorado River, which not long ago didn't release a cubic centimeter of water into the Gulf of California. Seven US southwestern states all wanted a share of the river's water. State-by-state quotas were established in the 1920s, the worse time of all because the river was then at long-term highs, not at all typical of the present decades, or of today's droughts. There were arguments and lawsuits. Every state struggled to get as much water as it could with the 1922 Law of the River, an edict that sounds like something happy out of Middle Earth. Issues went to the Supreme Court, some cases lasting more than a decade. The glory of Fleck's book is that he saw through all these struggles between one state's agency's position, Mexico's interests (often ignored), California's seemingly inexhaustible thirst (kind of a bully), thirsty Arizona and Las Vegas, and the ever-forgotten Native Americans. He recognized that these had, in recent years, been superceded by a network, a network of people from state agencies, tribes, environmental groups and more, who came to realize that working together, quietly in the background, hashing out their differences at conferences of specialists and friends, at happy hours afterward, at small gatherings at hotels in the region -- that this approach worked better, more smoothly, more fruitfully in overcoming differences and finding a way to real agreements. Person-to-person. And to this day. That's not easy for a writer to recognize. It would have been much easier to write a book about all the looming shortages of Colorado River water, how (it's claimed) it simply cannot meet all the water needs of the big southwestern cities, and southern California as well. But Fleck drove all over the southwest, watching dams open and talking quietly to the state and national officials who made those happen. The water kept flowing. That's Fleck's second significant realization -- that, when water is scarce, regions and cities and states learn how to make due with less. It isn't a mano-to-mano struggle over every last drop of water -- water managers have learned that there is no hope for one if there isn't hope for all. Albuquerque, Las Vegas, LA -- all have made major strides in water conservation. 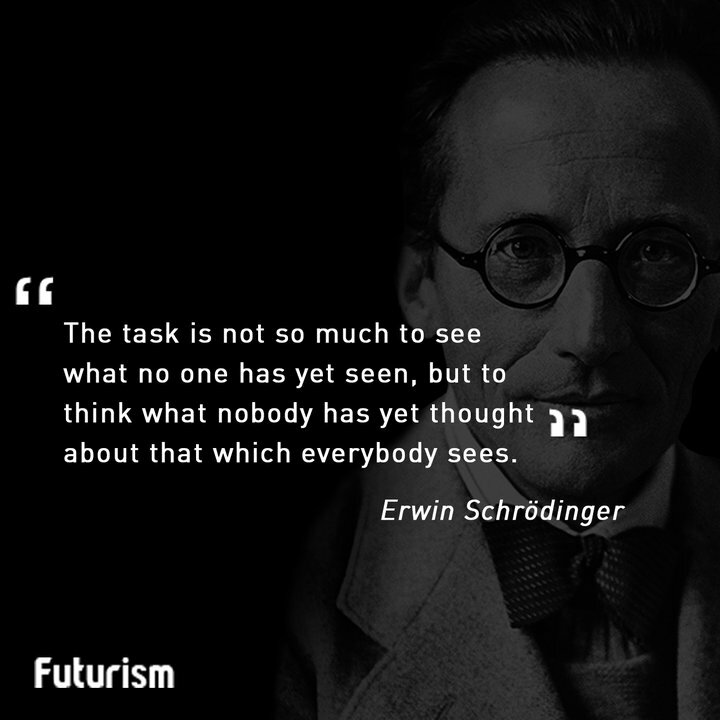 And John had the foresight to recognize that, and write about it. So this book isn't an update to Marc Reisner's 1986 Cadillac Desert. Fleck's book looks deeper, for the real story, the human story of how people are making it work, and it finds optimism. And that isn't a message a writer finds every day, or, either, that the reader hears every day. I am proceeding with a law suit against Joanne Codling (joanne@goldnerds.com), whose stage name is "Jo Nova." This lie comes from "Phil Jourdan" (who I've heard might be "mpainter" who was banned from Roy Spencer's blog). You'll notice he accused me of "stalking and threatening children," which in no way does his citation support. He's on the list too. BTW, James Sexton wrote this over three years ago, but I pay so little attention to him I didn't see it until now. I have already been in touch with Wordpress about Sexton's libelous post. About this: Jo Nova said she took the offending post down -- but she won't publish her words saying so, or my words complaining, thus leaving her readers to think no action was taken at all. Maybe there is some tipping point. I haven't seen anyone explain that -- have you? Otherwise Antarctic sea ice is going to have a statistically signifant positive trend for a very long time. Personally, there's no reason to base a year on the 12th month that ends a so-called messiah's birth. All the major temperature indices, I think, have reached highest-in-record 12 months moving averages, this year. Using my nifty-difty equation for the fractional loss of a quantity that has a linear trend, Arctic sea ice volume is now down 45% since the record started in January 1979. Anyway, Arctic SIV is declining steadily and scarily. In less than just 40 years. "John Christy, my fellow skeptic and fellow co-recipient of this year's Nobel Peace Prize (by virtue of having our names listed in IPCC reports) in the WSJ [ITEM #4]"
A Sticking Point About the Movie "Alliance"
I saw the movie Alliance a couple of weeks ago. It's pretty good, especially if you like good, mostly hard science fiction. But somethings still bothers me about it. This isn't giving anything away that's not in the trailers, until I warn you. In the picture to the right is symbol containing a sentence (or some complicated thought) of the alien's language. 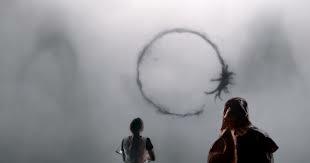 The plot evolves around a linguist's (Amy Adams) ability to translate such symbols and so try to communicate with the aliens. Before this she approached them with a whiteboard on which she'd write her name or a word from English, but that didn't work. Instead she works on translating their language. The way they show her doing this is good stuff -- she tries to break down parts of the loop (and they're always loops) into individual "words" or "thoughts" or "feelings" or the equivalent. Eventually she succeeds somewhat, but it's too late and the politicans of the world take to aggressively dealing with what they see as a massive threat to the and to Earth. (There are about 12 of these ships at various points around the globe.) Of course that ruins everything. Now you should stop here if you don't want to risk any spoilers. Slate had a interesting interview with a real linquist who gave some insight into how different language structure words or thoughts. And a summary of what the plot means. Apparently the aliens experience "nonlinear time." (I didn't get this this until I read about the movie afterward.) Their loops contains subsymbols that aren't necessary in a linear time order -- the aliens think about time cyclically instead of in a straight line. Slate: "As Louise [the lingust] learns the language, she also begins gradually experiencing visions of her future, a sign that she too is beginning to experience time differently." I don't know what nonlinear time is. I don't see how it wouldn't violate causality. I don't see how the speed of light could be a constant in all reference frames, as we know it is. 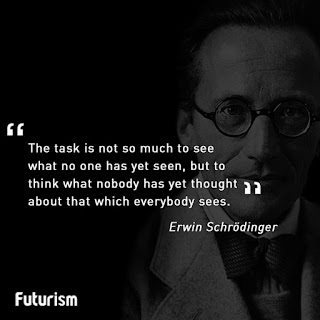 (Einstein assumed that as a postulate of special relativity, and by the accuracy of its predictions we take it now as a fundamental property of the universe.) If time is cyclic, couldn't you, in particular, travel from where you are today and when and come back to the same place and time? Or at least the same time? What then if you didn't do the same thing you did the first time? How can these aliens be just a few feet from humans and experience time so radically different? That's just one thing that bothered me. The other is that, here are these aliens who managed to come here, en masse, from who knows where in the universe. They also know something about antigravity, or altering the direction of gravity, as the early parts of the show make clear; also their spaceships hang silently several meters above the ground. So these beings know how to do all this, and we have to translate their language?? They can't translate ours? Nonlinear time presumably has linear time as its zeroth-order leading term, and but they don't understan that? They are clearly very intelligent compare to us, but they can't translate a simple linear language? I didn't find that convincing. Of course, the plot hangs on the struggle to understand their language before Earth's countries try to bomb them to hell out of them (trivial for them to handle). Without that struggle, the plot would collapse into much less than it is, and probably not enough. So in these senses the movie isn't exactly hard scifi -- it alters reality for the sake of its plot. Just when they started getting to the good stuff, they pull a deus ex machina. The fact that a lot of people needed the plot explained to them afterward shows this didn't really work. Still, it's a movie well worth seeing. "You're sitting in a CHAIR in the SKY"